The ABC newsletter, the Anfield Circular, celebrated its 100th anniversary in March 2006. Though there are other cycling magazines that are older and grander, none capture character and personalities quite like the Circular: with gentle humour, irony and wry observation, through the words of the members. What makes the Circular so special is that you can follow the fortunes of individuals as well as the club and the countryside explored - through all the turbulence of the twentieth century. The ABC did not set out to create a detailed account of club life - the Circulars were not meant to be kept. But some members did keep theirs, and a century later there is a complete record - some six million words - and a unique social history in the tradition of English diary literature. What surprises is that for the first twenty-seven years, from 1879 when the Anfield Bicycle Club was formed, the Club managed without a regular newsletter, relying on runs cards and notices to inform members where and when rides would take place. Members thought it enough to summarise each year's touring and racing events in annual reports. Even in 1906 when the first monthly Circular was published its purpose and worth were questioned. But by 1910 it was an accepted part of club life. Descriptions of club runs, tours and racing successes have formed the basis of the Circular's reporting, enriched with irreverent banter and gossip, and respect, comradeship, and mutual support. There were regular visits to Ireland in the years before the First World War, usually arranged to coincide with a racing event. In the September 1912 Circular an article "In Erin's Isle" by E A Bentley, describes an August weekend to the Irish Road Club's 100 miles time trial near Dublin. The author, who also rode in the event, evokes a wonderful atmosphere of a cycling weekend exploring the Wicklow hills. The race took place on Monday 6th August. Riding for the Anfield were Lowcock, McCann, Bentley and Grimshaw. While Grimshaw won by a margin of 15 minutes, Bentley grumbled about the roads, the marshalling, the handicapping and the starting-order of the riders. But "As a competitor", he concluded, "if anyone asks me to go to Ireland next August, even to try over these roads, for the honour of the ABC, I shall say 'Cert'nly'". Whether, through gritted teeth, he then added "not" is unrecorded. The war ended all this, and sadly, Bentley was one of our casualties. While serving with the Cheshire Regiment in France in October 1916 he was severely wounded, and, the Circular records, he died in hospital from his injuries. During the First World War the club sent parcels containing small luxuries like chocolate, tobacco and writing materials to serving members. A steady stream of news from the recipients and first hand accounts of the war were the Anfield's unique reward, all published in the Circular, under the outstanding editorship of Arthur Simpson. Halewood, near Liverpool, was the setting for the annual club photograph on 1st June 1918. Amongst the forty-five members attending were several in uniform. Membership rapidly grew after the First World War to over 200. At one point so popular were club runs that we set limits on the numbers attending. Recurring themes in the Circular included the great controversy over compulsory rear lights, grumbles about road hogs driving "mechanical honk chattering annoyances", and damage to roads by motors. Two personalities dominated the pages of the Circular this decade: W P Cook and W M Robinson: W P Cook (left) was regarded as one of the greatest cyclists of his generation. Few if any knew the countryside of Cheshire and Wales better. And he was adventuruous, memorably hauling a tandem, with the help of climbing ropes, over the Berwyns in 1916. Among his achievements is the Cyclists' War Memorial at Meriden. He was a national figure in the higher politics of cycling, and a vice-president of the CTC. A tireless fund-raiser and advocate on behalf of the sport, but the Anfield was at the heart of his life. Indeed for three decades his fearsomely strong personality dominated the club. Cook was an Anfielder from 1887 until his death in 1936 following an accident while riding from his home in Birkenhead to preside at the AGM of the RRA in London. A keen tricyclist he is thought to have ridden some half a million miles during his lifetime. 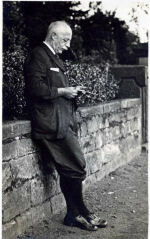 Walter MacGregor Robinson was best known by his pen name "Wayfarer". For cyclists emerging from the dark years of war, he was inspirational. His special place in cycling history stems from the articles he wrote in the 1920s and 30s for cycling magazines. He packed in the crowds up and down the country for his lanternslide lectures. His name is still remembered 50 years after his death, thanks to the memorial to him on the Berwyn rough stuff crossing, better known now as the Wayfarer track. Wayfarer drew on his experiences of riding with fellow Anfielders for his articles, and was an enthusiastic contributor to the Circular in which his generosity and preference for buttermilk were teased mercilessly. That there is now a bar named after him in the West Arms Hotel, Llanarmon Dyffryn Ceiriog, would have been a source of great merriment. The photo shows Wayfarer and Cook on the Pen Bwlch Llandrillo, above Llanarmon Dyffryn Ceiriog, on 30th March 1919, following the clubrun to Rossett, near Wrexham in North Wales. It was this adventure that established Wayfarer's reputation and inspired generations of	cyclists to explore off the beaten track. The Circular (probably Cook writing about himself) reported: "The snow was deep, in places of drift many feet, but so hard that it was easily negotiable and only once did the old gentleman drop into a crevice up to his waist." A young generation of Anfielders in the 1930s brought new ideas but also continued the traditions of hard riding and record breaking. With Jack Salt, Bren Orrell and Jack Pitchford the leading riders, in the 1930s we nurtured our most powerful team since the 1890s. Jack Salt joined the ABC in 1931, already a crack racing man. His performance at the historic Brooklands circuit in 1933 led to his selection for the English team in the World's Championship and he was in the BAR top 12 from its inception in 1930 to 1934. In addition to his prolific time trialling successes, he captured RRA and NRRA records. Great racing man though he was, he was also an enthusiastic clubman until his death in 1960. The Circular was the beneficiary of his writing skills, recording his delight at riding in the countryside and lanes of Cheshire and the Welsh Borders. Bren Orrell was the first Anfielder for 35 years to win the 100, in 1930 and 1933. The photo shows Orrell in the Manchester Grosvenor 100 during the 1930s. He was the winner of this event for six consecutive years from 1927 to 1932, and third in 1934. Like Jack Salt, Orrell rode in the Worlds Championship (1930) and notched up many RRA and NRRA records. A characteristic of cycling is that sons often follow fathers into the sport. So it was with Bren and his son. Success must have been in the genes, because Bren junior's ride in the 1953 Manchester Wheelers 12 hours set a club record of 245.11 miles that has stood since then. Even during World War 2, despite the disruption graphically described in Frank Marriott's editorial, and scarcities, paper was always found for printing. The Circular was published with no break in continuity. Anfielder George Stephenson's publishing company in Prescot had subsidised the cost of the typeset Circular from its earliest years. But by 1962, costs proved too big a burden for the Stephensons and there followed a change to much less expensive duplicated printing. After the war with membership dropping (135 in 1953), the need to recruit new and young blood was a central concern. The question was succinctly put in the October 1949 issue of the Circular: "Can some modernisation be carried out without spoiling the work of those who built better than they knew?" New recruits trickled in. They included John Futter who learned his skill as a rider (together with the ability to spell "Bluemels") on Jack Salt's back wheel. "Modernisation" came in 1958 with the far-sighted Cadets' Scheme: "Every effort will be made to introduce the Cadets fully to cycling and club life and it is hoped that most will wish to join the club when no longer eligible as Cadets" said the Circular. Among the first were David Barker, John Farrington, David Bennett and Rod France, and scores followed. In charge were Guy Pullan, Les Bennett and John France, with support from many including Ken Barker (whose editorship of the Circular at this time set the highest standards), Frank Marriott, Reg Wilson, Jeff Mills and Allan Littlemore. Cadets and mentors too were under the wise counsel of President Rex Austin. The scheme flourished and without doubt is the main reason for the Anfield's survival into the twenty-first century. From our earliest years a Saturday evening meal served at six o'clock was the focus of clubruns. But in the 1960s lunchtime fixtures became the norm. We continued to make our way to them by choice, either singly or in company, as we still do. And we adopted Guy Pullan's maxim "that for cycling to retain its interest indefinitely, routes should be chosen adventurously, spontaneously and always with variety". Touring holidays in the Scottish Highlands led by Les Bennett and Youth Hostelling weekends introduced the new generation to another Anfield tradition "roughstuff", as in 1963 to Wayfarer's memorial on Nant Rhyd Wilym in the Berwyns (top). We were good at road sport too. John Parr won and then defended the Edinburgh - York trike record, and we were fortunate in riders like John Whelan (top left), John Moss, Keith Orum (centre left), and John Thompson who have contributed to the sport in the best tradition of the all round clubman. Outstanding in this tradition is Ben Griffiths (bottom left): his racing career spanning seven decades, and counting. Betws-y-Coed and the Roman Steps, Autumnal Tints 1980. The Circular recorded that 16 were in the party who tackled this famous roughstuff crossing, and "at least one hour elapsed between the first arrival on the Trawsfynydd road, and the last". With the innovation of the mountain bike this was the decade when the rest of the cycling world discovered roughstuff but called it "off-roading". The Circular records expeditions to mid-Wales, Snowdonia (above on the Bwlch Rhediad, Nant Gwynant), the Lakes and the Derbyshire Peaks. Riding the Knutsford Great Race on penny farthings was one of the most remarkable ABC exploits since the legendary 100 miles "scorches" of Artie Bennett, GP Mills, and Lawrence Fletcher in the 1880s. Afterwards we all could see why the "safety" was named, and so quickly replaced the "ordinary" bicycle. On 24th September 2000, President Tony Pickles, Martin Cartwright, Mark Livingtone, and Chris Edwards acquitted the Anfield with honour and great style in atrocious conditions around Knutsford Moor, riding a penny farthing loaned by fellow Anfielder Glynn Stockdale. The race was not without hazard: Tony and Martin both came to grief. We were most concerned about Martin, brought off by another rider. He ended up in casualty with a cracked elbow and nasty black eye. What worried us was that he had a very important appointment a fortnight later - his wedding. Rumour was that another black eye awaited him if the first was not gone by the ceremony. So we sent in Stuart Twigg as Martin's witness just in case. We were pleased to report all went well. Among the crowds, Alan Orme, Dave Edwards, Keith Orum, Geoff Sharp, Bill Graham and Phil Looby helped with marshalling and crowd control.